Climbing ethics are a slippery slope. For this reason I seldom choose to discuss them on the internet. It's very easy to snipe at people from afar; it's difficult to do the same thing in person. 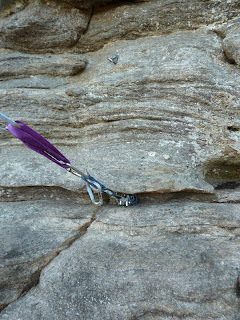 As climbers, everything we do at the cliffs mars the rock in some way or involves tools that make climbing easier. Short of staying inside at home, you'd have to barefoot free solo without chalk to claim you have high ethical standards as a climber. Well, do you have standards that high? Neither do I. So, since we've all admitted that we have "less-than-pure" ethical standards let's get on with it. I would guess that 99% of the climbers out there agree that fixed points of protection (bolts) aren't necessary when a leader can place good gear in cracks to keep falls safe and reasonable. Many climbs have runout sections though. These stretches of rock can be protected by bolts. If and how these bolts are placed (frequency, location, type of bolt) is generally determined by the first ascent party. Sometimes a route is nearly a sport route and the first ascensionist will choose to bolt the entire route so that climber's don't have to carry an entire rack only to place one piece of gear (this is ok in some areas). 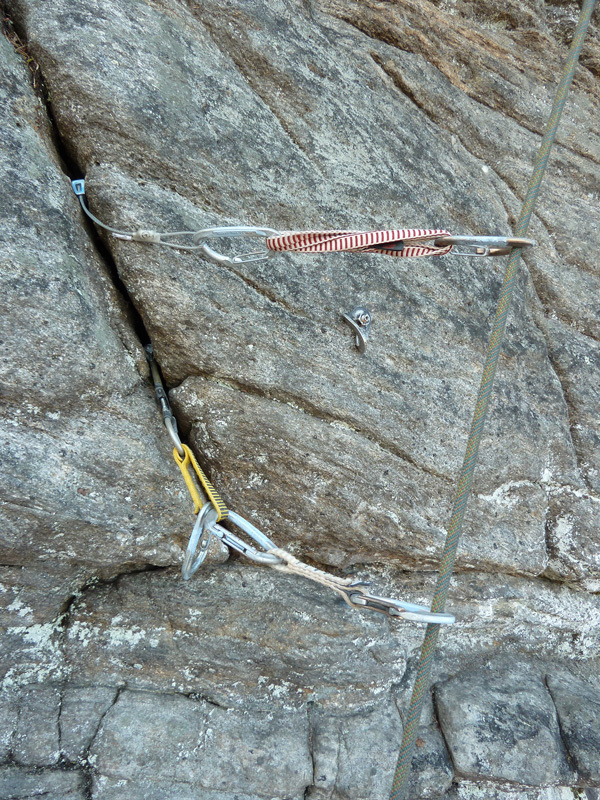 Other times, like in the case of Farley Ledge, mixed bolt/traditional routes have a yellow first bolt indicating that the climber should bring a rack to protect the unbolted stretches of rock. 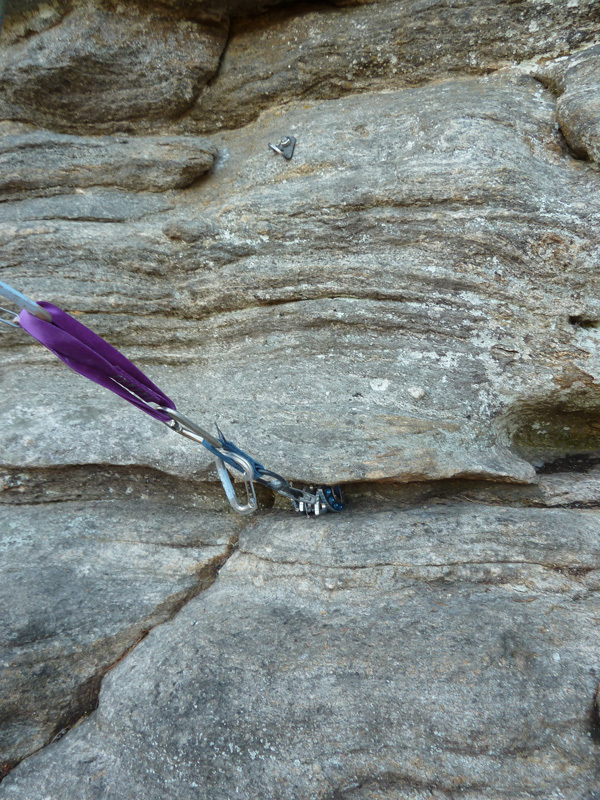 When a route protects well with gear and has already been lead on gear why would someone else choose to add bolts to this route? Anyone? Anyone? I encountered this scenario about two weeks ago and I wanted to put some photos out there with a few descriptions. Perhaps I can elicit a sensible explanation for this from someone. I skipped this one. 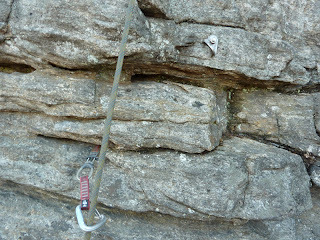 It's close to the ground, and to me it made sense to gain a ledge ten feet up to place my first gear. This #3 Camalot is placed in a horizontal, and while it's a little shallow it is very solid. Notice the bolt 30cm above the cam placement on the slab. Here I have a red C3 (#1) placed in a deep horizontal. I'd bet the farm on this one. Notice the bolt just above. Also make note of the abundance of cracks of varying depth all over the place. Again I placed two pieces. The lower gold camalot (#2) is shallow, but should be more than adequate. The gray C4 (#.4) is more than adequate on it's own. If you're having trouble spotting the bolt it's just left of my bomber gray cam in the deep crack. We can haul my subcompact car up from the parking lot off these babies. Purple and Green C4's offer stellar protection through the crux bulge. The bolt is just to the right of the really good purple cam if your eyesight or judgment is bad. Mine's not so I'll help you out. Ahh, the anchor is real kick in the pants. 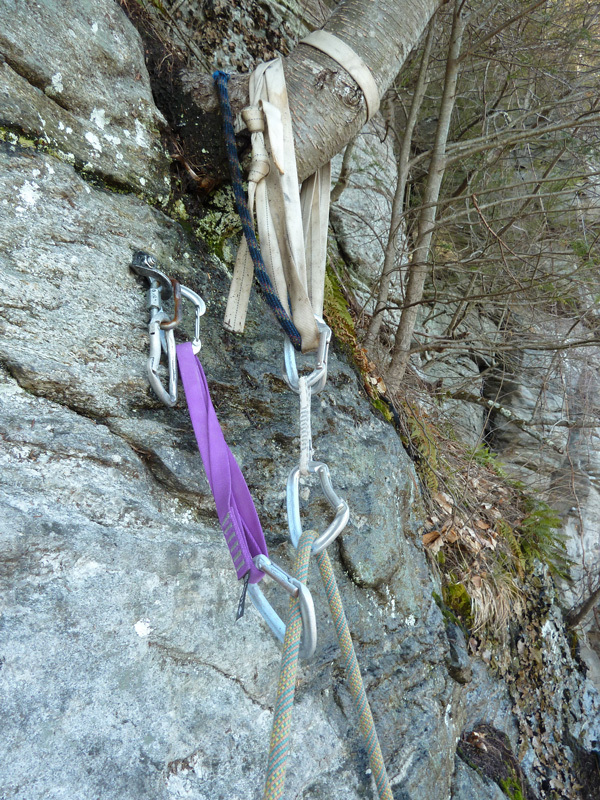 Six bolts protect the climb yet the bolter chose to place only one bolt on the anchor backing up the tree. The tree alone is fine for a while. It's about 5-6 inches in diameter and has good webbing around it. However, the webbing will eventually girdle and kill the tree. Bolts are often a better long-term choice than trees in many cases. Why just one when you've already placed six? Don't cheap out on us now. I'm not a bolt chopper. I've even placed my share of them, but never on someone else's routes. Chopping bolts doesn't accomplish anything and it definitely places climbers in real danger. Placing needless bolts is a waste of time and money though. It deprives future climbers of necessary skills that they can use climbing at other areas. Placing bolts well requires careful thought and consideration. It's not a process that should be taken lightly or executed quickly and thoughtlessly. Well bolted routes can help define a climbing area as outstanding while poorly bolted routes destine those routes and the area to obscurity. More than anything else, this is food for thought. We're on the cusp of a bolt revolution. 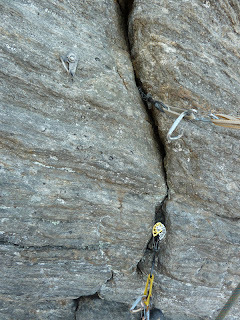 How this bolting is executed by current individuals will set the stage for future climbers. Let's hope it gets done well.